Researchers from the Purdue University College of Veterinary Medicine’s Center for the Human Animal Bond will analyze the influence service dogs have on the lives of military veterans suffering from post-traumatic stress disorder (PTSD) in a unique clinical trial. According to the United States Veterans Administration, 22 veterans commit suicide each day, and at least 40 percent have been diagnosed with PTSD. The rate could be even higher, as many cases of PTSD go undiagnosed. Previous studies have suggested that individuals who bond with their pet dogs exhibit elevated levels of oxytocin – sometimes referred to as the “cuddle hormone” because it sparks emotional responses that contribute to relaxation and trust. Additionally, the National Center for PTSD claims dogs can encourage veterans to communicate more through commands and training, and prompt them to spend more time outdoors and meet new people. These benefits support anecdotal reports that show an increase in the prevalence of service dogs for individuals with PTSD, but scientific evidence examining this growing trend and its effects on PTSD patients is still lacking. To help carry out the study, the research team has partnered with K9s for Warriors – one of the nation’s leading providers of service dogs to military vets suffering from a variety of conditions including PTSD, traumatic brain injuries, or sexual trauma as a result of service post-9/11. The team hopes to determine what sort of PTSD symptom changes veterans may experience as a result of having a service dog, as well as any effects on social functioning and physiological biomarkers. According to a university release, standardized survey instruments and objective measures of physiology will be used to track stress and functioning. The researchers will also use a novel ecological momentary assessment protocol to capture the role and function of the dogs in everyday life. The results will be the first evidence-based data to be published that quantitatively identifies the roles and effects of service dogs for military veterans with PTSD. The study is unique because it applies research methodology and evidence-based science to an area that has typically relied on emotion, according to O’Haire. “Without scientifically sound studies that establish proof-of-concept for the therapeutic efficacy of PTSD service dogs, this animal-assisted intervention strategy will continue to be minimized as an unsupported and potentially unsound practice, despite anecdotal reports that the dogs may have a significant impact,” added O’Haire. When veteran Justin Lansford got married last month to long-time girlfriend, Carol, his best man was his support dog Gabe. A Golden Retriever, Gabe was matched with Lansford when he returned from Afghanistan an amputee thanks to an IED explosion in 2012. Lansford lost his left leg to that explosion and also suffered from post-traumatic stress disorder. A big shout-out to Justin, Carol and Gabe….may you have a long and happy life together! I just found this very short item on the San Francisco Chronicle website. 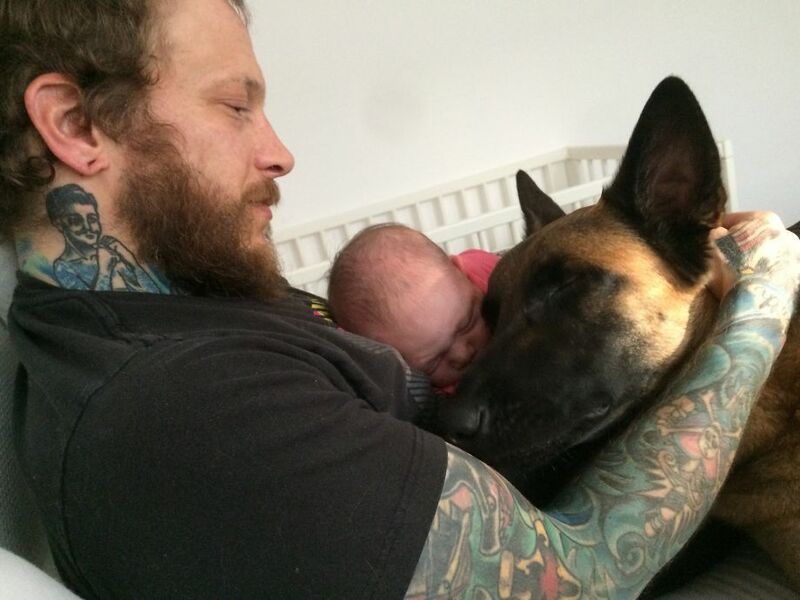 A photo of a heavily tattooed man, his baby and his dog…. The man is Ari Sonnenberg with his daughter, Nila Louise Sonnenberg, born April 1, 2015, and his Belgian Malinois dog, Sigmund Freud (also known as Siggy). A simple photograph and a lovely sentiment. Siggy sounds very special and his presence has clearly been a help to the couple. The body of knowledge about the value of dogs for our physical and mental health continues to grow, with research and study and stories like those of Siggy and his owners. The city of Pawtucket, Rhode Island had a 10-year old ordinance banning the ownership of pit bulls until earlier this week. A judge ruled that a 2013 state law banning breed-specific legislation meant that the city’s law was now illegal. This is a win for the fight against breed specific laws and restrictions. Pit bull owners in Pawtucket celebrated on Sunday with a parade. There was also a free dog training class offered afterwards. A local group, Pit Bulls for PTSD, also participated in the parade. The group trains pit bulls to become service dogs for autistic children and veterans suffering from PTSD. Please remember: punish the deed and not the breed! Pets for Patriots is a charitable organisation working to place adult dogs and cats from shelters with veterans from the U.S. military. It is now well-documented that many U.S. veterans return from overseas only to suffer the ongoing effects of post-traumatic stress disorder. Animals help these personnel connect to civilian life and offer them the unique bond of non-judgmental support and love. There are many dogs and cats up for adoption in U.S. shelters – and any shelter, rescue organisation or SPCA can join the programme. The most important motivation is the commitment to find homes for hard-to-adopt animals. Here’s a video of one Pets for Patriots success story, the first Pets for Patriots adoption in the State of Hawaii. Paws and Stripes is a not-for-profit organisation working to place service dogs with US war veterans who are suffering from post traumatic stress disorder (PTSD) and traumatic brain injury. Through their efforts dogs from shelters are trained to have a new life as a service dog – all at no cost to the veteran. The wars in Iraq and Afghanistan has been going on for many years now, and with this the escalating numbers of returning veterans who are suffering from PTSD. Traumatic brain injury is often suffered because soldiers are injured by ‘improvised explosive devices.’ Sadly, insurance companies will not pay to see these men and women given the use of a service dog. 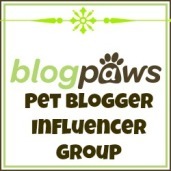 Jim Stanek is the co-founder of Paws and Stripes (along with his wife). He received injuries during his third tour of duty in Iraq and, during his nine months of treatment, he found solace in the presence of service dogs. In May of 2010, Jim and his wife unsuccessfully tried to find a trainer for their rescue dog named Sarge. They founded Paws and Stripes in June 2010 to fill the need for these types of service dogs. Veterans are able to choose their own dog from a shelter before entering the training programme and part of their rehabilitation is their involvement in the training. This seems like a very special organisation combining the involvement of service dogs with shelter rescue – all whilst helping a group of people in need. Visit the Paws and Stripes website to learn more about the programme and how to help. While there, read stories like that of Master Sargeant Justin Jordan and his dog, Dallas (pictured below – photos copyright Paws and Stripes).